LAKE SUCCESS, N.Y., August 29, 2012 – As the production of motion pictures, episodic television shows, commercials, documentaries, and other program content increasingly transitions to digital, Canon U.S.A., Inc., a leader in digital imaging solutions, continues to provide innovative Cinema EOS products designed to enable the most discerning filmmakers and producers to capture their unique creative visions. 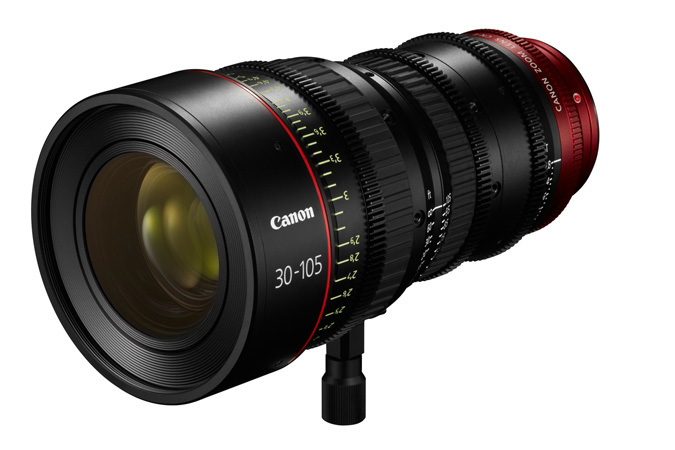 The latest of these Canon products, two new compact and lightweight cinema zoom lenses available in both EF- and PL-mount versions, were first announced at NAB 2012 and have now been officially added to the Canon Cinema EOS product line. Designated as the CN-E15.5-47mm T2.8 L S/SP wide-angle cinema zoom lens and the CN-E30-105mm T2.8 L S/SP telephoto cinema zoom lens, both are engineered to deliver exceptional optical performance for the latest large-format single-sensor 4K and 2K digital cinematography cameras. Both lenses feature a compact, lightweight design to facilitate handheld and SteadicamTM shooting while also covering a wide range of focal lengths. Further contributing to the evolution of the motion picture industry, Canon has also announced the development of two new cinema prime lenses, the 14mm T3.1 cinema prime lens and 135mm T2.2 cinema prime lens, adding to the Cinema EOS lineup consisted of 11 EF Cinema Lenses. Both the 14mm T3.1 and 135mm T2.2 cinema prime lenses will be engineered for exceptional optical performance for Canon's latest large-format single-sensor 4K and 2K digital cinematography cameras. As part of the Cinema EOS System, the lenses will be compatible with standard sensor sizes including Super 35mm, the standard format in the motion picture industry, as well as HD-compatible EOS Digital SLR cameras using 35mm full frame, APS-H and APS-C image sensors.